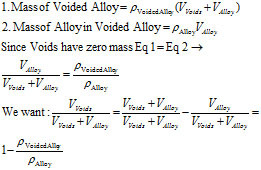 Dear Dr. Ron, I need to measure the void content of an alloy. Is there an easy way to do it? After a little thought, it occurred to me that the densities of the voided and unvoided material will likely hold the answer. I derived the result below. Assuming we know the density of the unvoided material, we can measure the density of the voided material with the Wet Gold Technique, discussed in recent posts, if the voids are not connected (closed cell.) If the voids are connected (open cell), you could machine the foam to the shape of a rectangular parallelepiped and determine the density of the foam as the mass divided by the volume. As an example, let’s say you have a closed cell aluminum foam. We use the wet gold technique to measure its density at 1.5g/cc. The density of solid Al is 2.7g/cc. 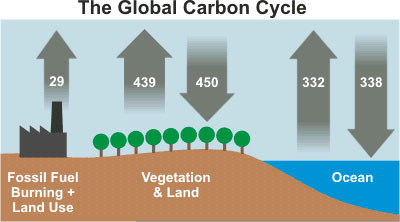 Global Warming Musings: My recent post on GW generated many comments. I will be sharing additional reasons why I am a skeptic at the end of posts like the one above. It is important to state the distinction between a GW Skeptic (me) and a GW Denier. As a Skeptic, I am not convinced that the warming trends are alarming or unusual, especially since the atmosphere has not warmed in more than a decade. Also, I am not convinced that the main driving force for the warming trend up to the late 1990s can conclusively be attributed to human activities. Lastly, I’m not convinced that even with Draconian measures, we could affect a change that would matter. It is interesting also to note that throughout history the temperature of the earth determined the carbon dioxide content in the atmosphere, not vice versa.